New Delhi: The Union Home Minister Shri Rajnath Singh inaugurated the two-day 11th Civil Services Day programme here today. The Union Minister of State (Independent Charge) for Development of North Eastern Region (DoNER), MoS PMO, Personnel, Public Grievances, Pensions, Atomic Energy and Space, Dr Jitendra Singh also addressed the function. The Civil Services Day function is being organised by the Department of Administrative Reforms and Public Grievances (DARPG), Ministry of Personnel, Public Grievances and Pensions. The Prime Minister Shri Narendra Modi will confer PM’s awards for Excellence in Public Administration to Districts/Implementing units and other Central/State organisations tomorrow for effective implementation of Identified Priority Programmes and Innovation. Speaking on the occasion, Shri Rajnath Singh said that Civil servants are fortunate to have certain opportunities, responsibilities and minimum facilities at a very young age and the country has a lot of hopes from them. He wished the civil servants on the occasion of Civil Services Day and said that Civil Services Day provides a platform to discuss and deliberate upon various issues and is also a forum to introspect. The civil servants should introspect their commitment to the people on this occasion, he added. He said that Sardar Patel had once said that if civil services was called ‘Steel Frame of India’ it would not be an exaggeration and the Guiding principles for civil servants as enunciated by Sardar Patel in 1948 are extremely important in present day context as well. The ‘Steel Frame’ of our Civil Services has not weakened even after seventy years of Independence, he added. 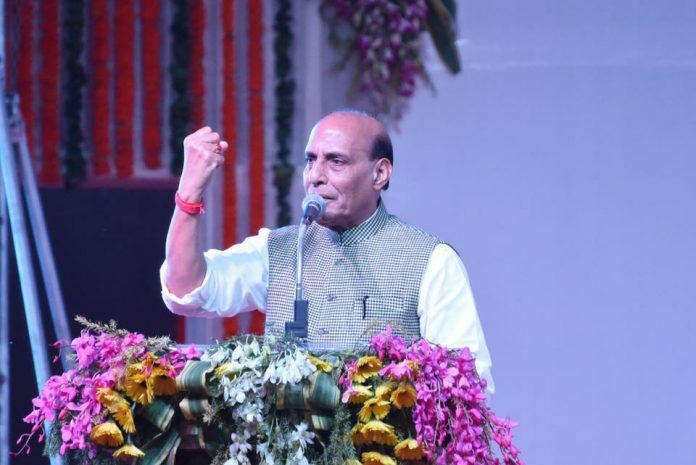 Shri Rajnath Singh said that India is emerging as a fastest growing economy and the standard of living of people has improved since independence and it is the responsibility of the civil servants to contribute to the better quality of life of the people. He said that civil servants provide administrative continuity in the country and Indian polity has never faced a vacuum in all these years. He said that civil servants have many powers, but power comes always with responsibility and accountability. The responsibility can be shared, but the accountability cannot be shared, he added. The Home Minister said that besides responsibility and accountability, third important thing is impartiality. If there is no impartiality in the decision, the decision can be wrong, he added. He said that the civil servants should endeavour to become part of the solution and should never be a part of the problem. Shri Rajnath Singh said that Prime Minister Shri Narendra Modi has always emphasised on the development and good governance and he has set a target of providing basic facilities such as housing, cloth, food, education and health facilities to the last man in the queue in the country by the year 2022. He said that the Government is committed for ‘Antyodaya’ and the Civil Services have to play more active and effective role to fulfil it. He also said that the civil servants should always follow rules while taking decisions and should convince the political executives if any decision seems to them to be in contravention of law. The welfare of people should be the parameter for taking any decision, he added. He also said that such decisions will give them happiness and respect. He said that a civil servant should interpret and implement rules and regulations with an open and progressive mindset. Shri Rajnath Singh also said that rules and regulations should act as facilitators and should not discourage the functioning. The Home Minister expressed faith that civil servants can contribute to the fulfilment of dream of ‘Making of New India’. The MoS (PP) Dr Jitendra Singh said that after independence, the then Home Minister Sardar Vallabhbhai Patel addressed the first batch of civil servants after independence and today also the civil servants are being addressed by the Union Home Minister Shri Rajnath Singh. He said that this is the occasion to reorient ourselves to the ‘Making of New India’. The civil servants should adapt themselves to the vision of contemporary leadership, he added. The Minister said that the Ministry of Personnel has made various efforts and taken many new initiatives in the last three years. The Government has taken steps to provide work-friendly environment, he added. He said that the target of the Government led by Prime Minister Shri Narendra Modi is: ‘Maximum Governance, Minimum Government’ and to achieve this, civil servants are an essential tool. Shri C. Viswanath, Secretary, DARPG said that Civil Services Day function is being celebrated since the year 2006. He said that this year’s theme is ‘Making New India’. He said that DARPG has obtained feedback from the District Collectors on the topic of “Creating Value through Human Capital Management in Government” and responses on questionnaire on shortlisted initiatives of Priority. He said that 533 DCs/DMs and 615 IAS officers of batches of 2013-16 have given their inputs. He also said that for providing level playing field to all, the states have been grouped into three Groups – the first group consists of eight North-Eastern States and the three Hill States of Uttarakhand, Himachal Pradesh and Jammu and Kashmir, second group comprises of the seven Union Territories and the remaining 18 States constitute the third group. For the awards to be given tomorrow on the Civil Services Day, five priority programme have been identified namely “Pradhan Mantri Krishi Sinchayee Yojana”, “Deendayal Upadhyaya Gram Jyoti Yojana”, “Pradhan Mantri Fasal Bima Yojana”, “Start Up India/Stand Up India” and “e-National Agriculture Market (e-NAM)”. In addition to the above, the award will also be considered for the innovative work done by the Central/State Government organisations in defined themes i.e environment conservation, disaster management, water conservation, energy, education, health, women and child centric initiatives etc. A total of 10 districts/Organisations will be awarded the Prime Minister’s Awards this year under the five Priority Programmes. These awards will be given in three Groups – the first group consists of eight North-Eastern States and the three Hill States of Uttarakhand, Himachal Pradesh and Jammu and Kashmir, second group comprises of the seven Union Territories and the remaining 18 States constitute the third group. In addition 2 awards will be given to Central/State organisations under Innovation category. The inaugural session was followed by a Plenary Session on the topic ‘Creating value through Human Capital Management in Government’ and three Breakaway Sessions on subjects related to Agriculture, Energy and Skill Development and Entrepreneurship are also being organised on the occasion. Cabinet Secretary, Shri P. K. Sinha, Additional Principal Secretary to the Prime Minister, Dr P. K. Mishra, former Cabinet Secretaries and senior officers were also present on the occasion.